U.S. solar companies installed a record 6,200 megawatts of new photovoltaic (PV) projects last year, a 30 percent leap over 2013 installations, a new industry report found. But the nation’s solar boom could soon hit a snag: A critical federal tax credit is slated to scale down in 2017, and analysts forecast new projects will decline precipitously without the incentive. “Without question, the solar investment tax credit has helped fuel our industry’s remarkable growth,” Rhone Resch, president and CEO of the Solar Energy Industries Association (SEIA), the sector’s main trade group, said in a statement Tuesday. 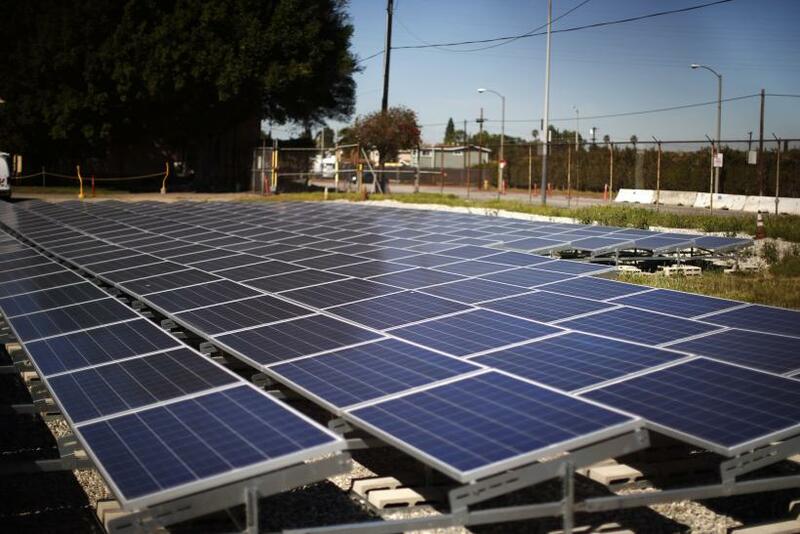 The new solar installations bring the nation’s total solar PV capacity to 18,300 megawatts. A handful of massive concentration solar power projects, including the Google Inc.-backed Ivanpah solar facility near in California, also came online in 2014, lifting the combined U.S. solar capacity to nearly 20,000 megawatts. That’s enough to power about 4 million average American homes, according to the year-end report by SEIA and GTM Research in Boston. Last year, each of the three solar segments -- utility-scale, commercial and residential -- grew by more than 1,000 megawatts, a first for the industry. Nearly 200,000 homes and businesses added rooftop or on-site solar installations in 2014, bringing the total count to more than 600,000 nationwide. 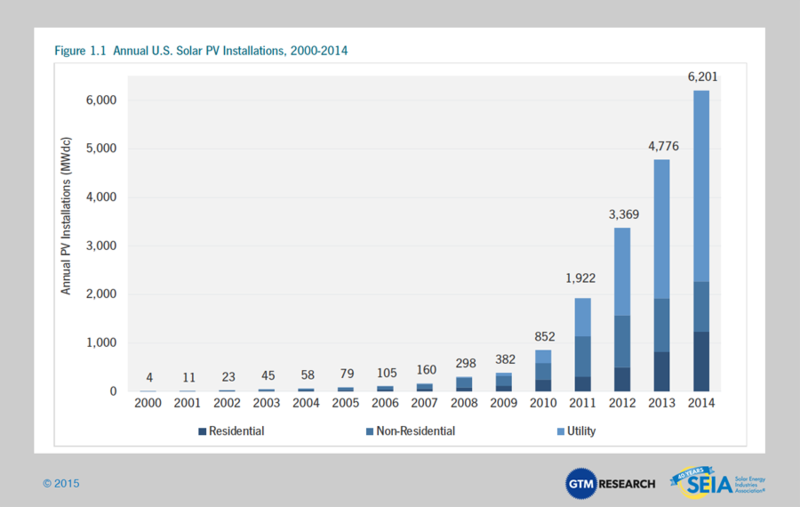 “Solar PV was a $13.4 billion market in the U.S. in 2014, up from just $3 billion in 2009,” Shayle Kann, senior vice president at GTM Research, said in the statement. Kann said he expects the industry will see significant growth in 2015 as installation and equipment costs continue to drop and banks make it easier to invest in or finance new solar projects. 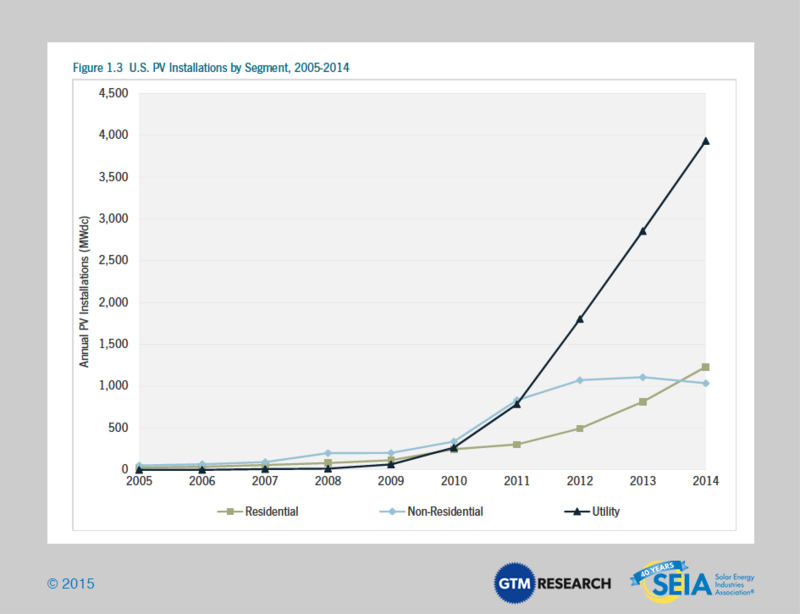 GTM Research forecasts the solar PV market to jump by 31 percent this year over 2014 levels, with the bulk of that growth -- about 8,100 gigawatts’ worth -- coming from large, utility-scale projects. Yet, most of that solar rush will be driven by the looming drop-off in the solar investment tax credit, which will shrink from 30 percent of total project costs to just 10 percent after Dec. 31, 2016, unless Congress steps in to freeze the subsidy. The Boston-based researcher says only about 1,000 megawatts of utility-scale solar projects would be built in 2017 with a lower tax credit, a drop of more than 85 percent compared with this year’s expected installation levels.